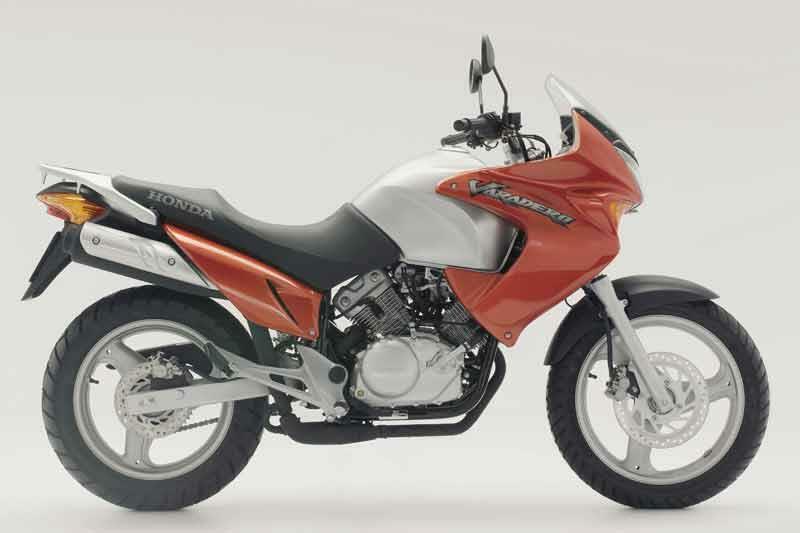 Although only a 125, there’s plenty of big bike feel with the Honda XL125 Varadero. The proportions are right, the motor feels spunky and as it’s a Honda you know it’s not going to fall apart beneath you. 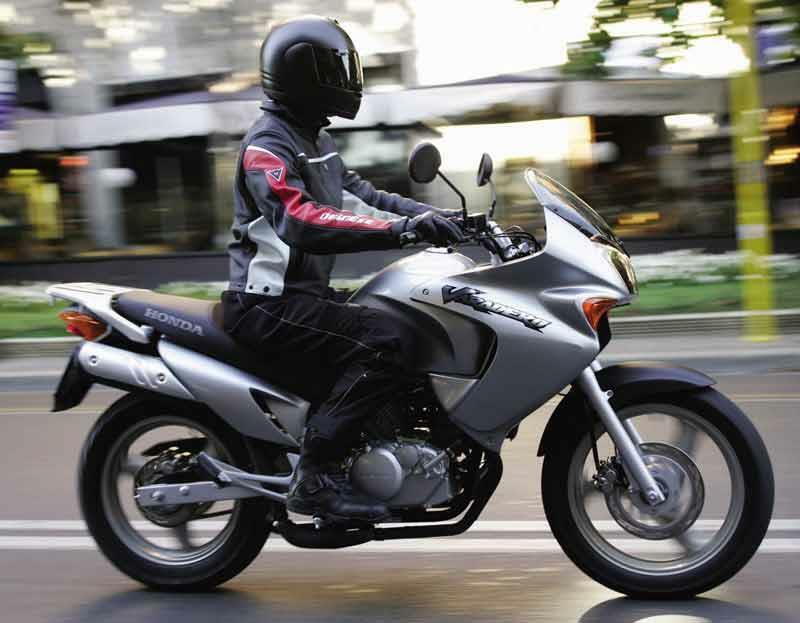 As a first bike or commuter the Honda XL125 Varadero represents a clever investment with its low insurance group and parsimonious fuel consumption. The Honda XL125 Varadero is a neat handling thing, thanks to its wide bars, a terrific steering lock, commanding riding position and poise. The brakes work fine, but it pays not to get too ambitious. The Honda XL125 Varadero's seat and riding position is very comfortable and not a bad place to spend a morning carving across town. There’s not much to get excited about with four-stroke 125s normally. And in the original VT125 Shadow micro-cruiser this V-twin SOHC lump just about copes. But in the Honda XL125 Varadero it rips around town just fine. With a low weight of just 149kg there’s not much mass to haul around, either. Just avoid long straights on the Honda XL125 Varadero. The Honda XL125 Varadero's mild steel downpipes rust through if they’re neglected over a winter, but that’s about it. Everything else on the Honda XL125 Varadero is up to Honda’s usual high standards. Compared to its XR125L and CBR125RR stablemates a new Honda XL125 Varadero is overpriced to the tune of almost £1000 and £700 respectively and it’s hard to say it’s worth that much more than either of the other two. However, Honda XL125 Varaderos do hold their value well, but not enough to tempt the canny buyer away from the other two. Find a Honda XL125 Varadero for sale. There’s a raft of official kit for the Honda XL125 Varadero, including hard luggage, a taller windscreen, a centrestand, heated grips and sump guard. 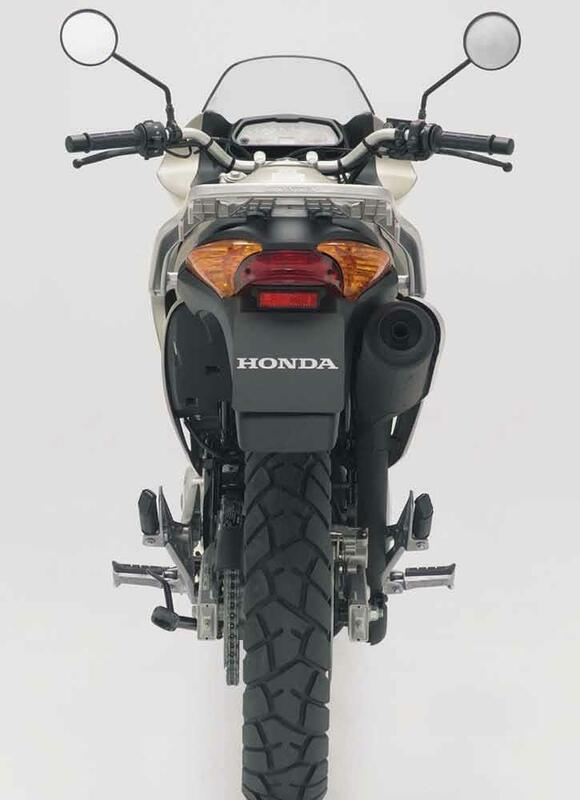 Most reviews from Honda XL125 Varadero owners will mention the addition of aftermarket parts. 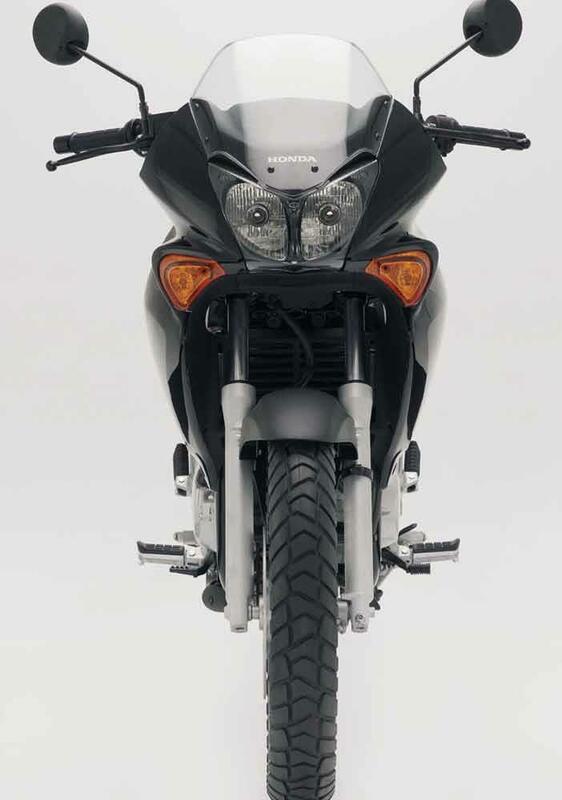 2001: Honda XL125 Varadero launched. 2003: Minor detail changes to Honda XL125 Varadero. 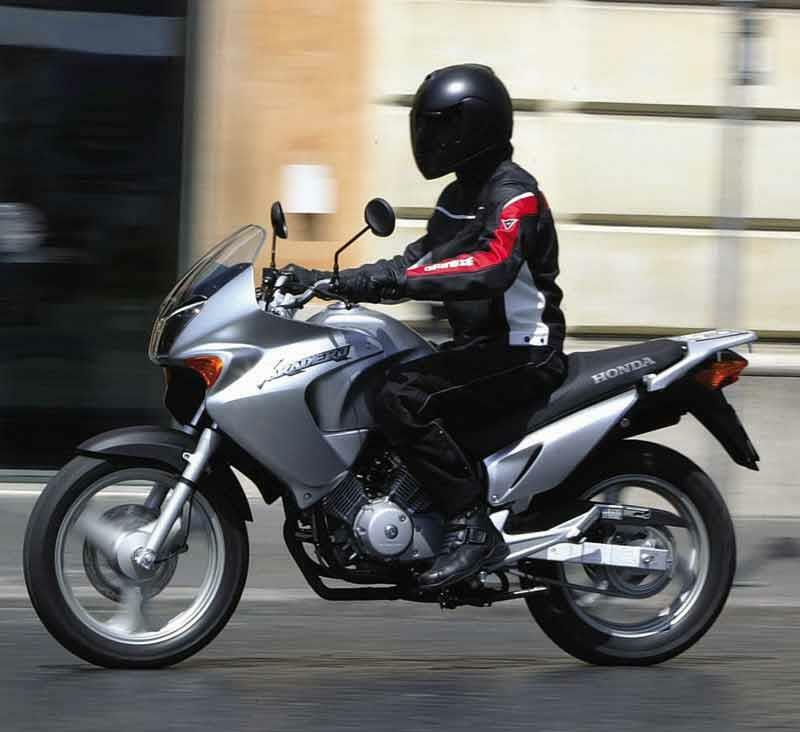 29 owners have reviewed their HONDA XL125V VARADERO (2001-2009) and rated it in a number of areas. Read what they have to say and what they like and dislike about the bike below. Bought this as a first bike before passing my DAS. I've got a full license now but I don't see any real reason to change the bike. It's big enough, will happily cruise to work at 65 MPH (with all 6ft and 15 stone of me on it) and keeps the cost of my daily commute down to a tank (bout £15.00) of unleaded every couple of weeks. I've been riding this bike to work every day and cruising in the countryside at the weekends and I've yet to really feel uncomfortable. The sensibly high (I'm quite tall) and wide seat feel like I've got a "proper" bike under me, not a toy. The seat height isn't unaccessible to shorter riders (my wife at 5' 7" can sit on it comfortably) but it means that I don't spend my time riding with my knees up under my chin. It's a 125 and doesn't have the pull of the 600 that I used on the DAS (obviously) but as I mentioned, I'm not a small chap and it still keeps up with all traffic up and down the hills where I live. Plenty of power for a learner or new rider. It's never missed a beat in all the time I've had it. I don't know whether this is usual for 125 bikes or not but its a lot more reliable than my car used to be. Good value from a fuel point of view. Decent sized tank and great economy. Just had a new Genuine Honda chain and sprocket set put on at £165.00 which made a lovely difference to the bike. Coming with a screen as standard is a godsend. It really makes a difference in the English drizzle or riding all day for pleasure. Bought privately for £1,850. Seems to be a fair price for the year and condition (2008). Standard brakes are fine but once you fit a pair of braided lines it transforms it so much! The brakes are much sharper than standard. Not much too rave about here, however the standard equipment is the best. I bought from a dealer with 3 months warranty as the bike was 2nd hand. Very easy process. I bought this reluctantly as my first bike back in 2008, as I had my eye on the yamaha YZF125, as I didn't think this bike would be fun to ride. Boy was I wrong. When I have ridden on the back streets though, it has been a blast. You do feel the size, but it is surprisingly agile through the corners, and stops well. It has been ridden all year round, and 2/3rds of its mileage is on the motorway and the engine is still pulling as strong today as the day I bought it. It has plenty of grunt for the motorway, though does sit very high on the rev band. Even so, the mpg were still very good. The bike did well even when I was travelling with a full top box, which didn't effect the bike much. Anyone after a first bike, or a strong reliable commuting bike then look no further. My first 125, had some real pull for a 125 but weighed a ton for a 125, great bike for a bigger rider with some big grip tyres pretty good bike all round. I've just part exchanged my 2003 Varadero after 5 years of ownership and I have literally nothing but praise for it. It's one of the larger 125's but that is is no way a negative, it means it is comfortable, large tyres offer plenty of grip and has a good road presence. The riding position is upright and the seat quite tall so you get a good view of the road ahead. The bike is still quite narrow though meaning good filtering qualities. Despite being heavier than most that weight disappears on the move and it feels light and flickable and quite fast for a 125. The engine is very willing and really smooth. It also looks very smart and most people would not suspect it was a 125 though L plates are the obvious giveaway. In all the time I owned it very little went wrong. I had to replace a few bits and pieces but nothing major, it just went on and on and started first touch every single time, amazing reliability. I bought mine for £1800 5 years ago and just got £1200 for it part exchange so they hold their value ridiculously well. They are hugely expensive new though at £4500, I suppose that is an indication of all the quality, "big bike" kit you're getting if you buy one but at almost twice the price of a CBF125 I reckon it's a bit of a stretch for a 125. I've ridden plenty of 125's in my time and the Varadero is streets ahead of all of them so I hugely recommend them if you can justify the price. This bike is in one word amazing, dont let the engine CC dissuade you for a first time purchase. I have owned this motorcycle for almost a year now and its fun factor alone is enough to make me want to keep this bike for the forseeable future. Some have complained that this motorcycle is sluggish because of its size and weight, I strongly disagree with this, the acceleration and also top speed of the motorcycle makes it more than capable of keeping in the fast lane and keeping up with traffic on hilly roads. One of my most favourite things about this bike is the fact that it can almost adjust to whatever riding style your in the mood for, it is capable of giving you the thrills if your in the mood for an adreniline fix, or give you the relaxed feel of a touring motorcycle. If you can afford it i would strongly recommend this motorcycle, i bought it used for around £3k and although the pricing maybe steeper than other 125s on the market, it is well worth it. I have owned the Varadero for a year but rode a few other 125s before. The Varadero is in a class of its own though. 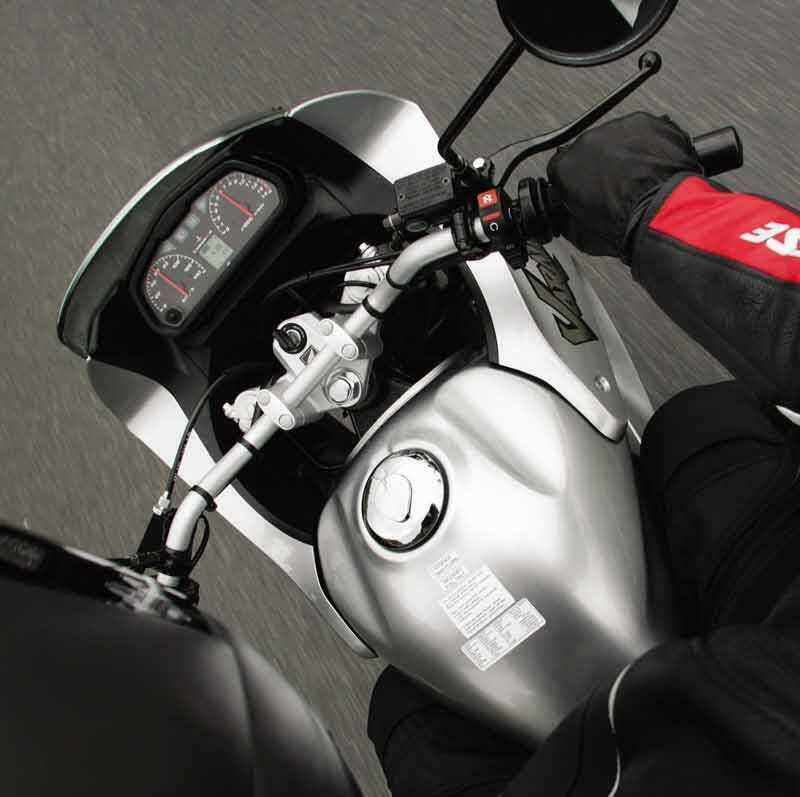 The suspension allows for more rider weight than other 125s so it is suitable for heavier riders or taking a pillion. Being a full 15bhp V twin, the engine can also easily cope with any additional weight. Because of the excellent build quality, it also feels more sure footed when travelling at speed or cornering. 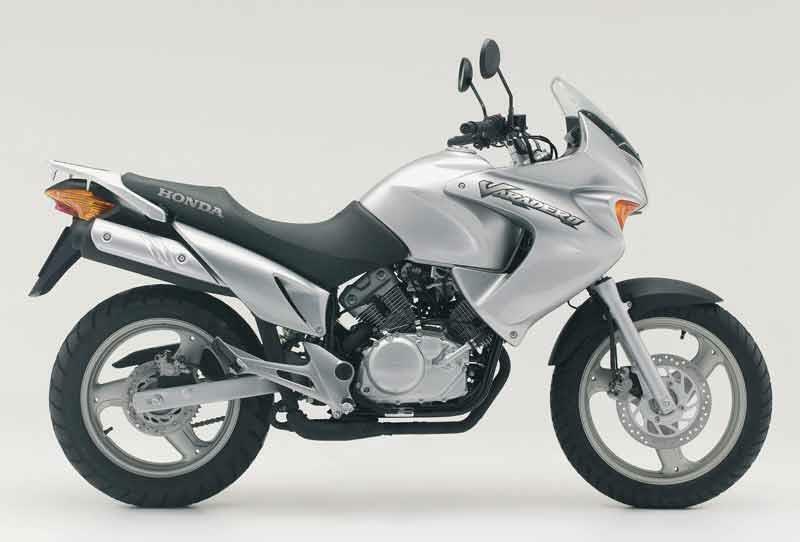 It has the quality and feel of one of Hondas larger bikes but with the smaller engine. I have passed my test to ride a larger bike but am keeping my Varadero due to the fuel ecconomy, big bike feel and the fact that you can still have fun on it. Having not ridden a motorbike for 25 years, I decided that with retirement looming I'd like a weekend "toy" for runs out on minor roads in the good weather (wife permitting of course). Decided that a 125 would fit the bill - but which one? I was tempted by a new Honda CBF but there was just something about it I didn't feel comfortable with. I looked at the Yamaha offerings, but was equally unimpressed. I even considered a Chinese bike. Whilst they looked OK, close inspection showed the finish to be nowhere near as neat as the Japanese products. Then, when browsing the "net" I was attracted to the Varadero. Very expensive new, but some reasonable second hand deals. I finally found my machine, a 2007 model, 4 years old with only just over 4k on the clock and a solid service history. Have had the bike a fortnight now and am enjoying it a lot. Being 5'10 and 15 stone I needed a fairly large bodied bike and the Varadero is just that. It looks good and isn't instantly recognisable as a small engined runaround. The motor is perky enough but oh what I'd give for a sixth gear. I toddle around at about 50/55mph which is what I bought the thing for, however the engine feels a bit strained at this point with the revs well up for a fairly ordinary speed. A sixth cog would help enormously, but ho hum! That said, for a 125 it's a quality bit of kit, well put together and a truly solid feel, nothing flimsy at all. I'm going to keep it for a couple of years at which point I'll either consider my biking days over or, on the other hand, move up to something bigger. At the moment however, I'm pleased to say that my Varadero is living up to expectation and I'd recommend anyone to buy one - it won't be a disappointment. I have owned this bike for almost a year now. Having owned a CBF 125 before, I have to say that the Varadero handles better, is far more comfortable and has a much better build quality. Despite being 15 bhp compared to the CBF's 11 bhp, it isnt that much faster. Maybe an extra 5 mph at best. You also really need to rev the Varadero to get it going. It redlines at 12,000 rpm and hits 6000 rpm when in top gear going only 40 mph. The fuel ecconamy is slightly behind the CBF. However, for me being 6 foot 1 and 18 stone, the Varadero is the much better bike. If you are looking for something that you can comfortably ride all day, the Varadero is the bike for you. If you are considering paying the extra money purely because it offers the full 15 bhp allowed by law, I would probably say save your money as its not much faster than 11 bhp 125cc bikes at half the price. I clock up 100 miles a day going from dep dark essex to London & back and I must admit I can;t believe that a 125 can be so good she goes fine up the A12 sitting at 65-70,has done 80 with the wind behind me downhill, and I'm not exactly a small chap anymore (6ft or so & about 15 stoneish). Now the suns out its even more fun on the back roads and only takes a tenner or so every 2 days to fill up which I think is amazing. I'm looking forward to getting a bigger bike but this things so good I'm no rush at all. I have owned my 2005 varadero for nearly a year now, and despite only clocking up 7000 miles so far i am pretty sure it is nearly the perfect 125. I took both my module 1 and 2 tests on this bike and passed first time, which goes to show that despite the big bike looks and weight it handles great, taking on every manoeuvre with ease. The wide bars and seating position give the rider a dominant position, which is just what i needed after getting swiped on a roundabout on my old cg by a driver who 'didn't see me'. The engine has reasonable pull considering the capacity and the weight it has to heave, with most of the power(typically V twin) in the higher range, with nothing much happening until 8 grand. It redlines at 12,000 rpm and if you want to be doing motorway or reasonable A road speeds then thats about where you will be sitting. The bike doesnt like going above 50mph I find and being mechanically minded I hate to pin it over long distances at high speed. despite it being a Honda I find my hand hovering over the clutch every time I am travelling long distance at 60mph +. I think that if the gear ratios were revised and a 6th overdrive gear were added, it would be perfect. Brakes are ok but really need some gripping to come to a halt quickly and two up you'll need to chuck out an anchor. I find that MPG is pretty good, taking into account the weight, gear ratios and the rev range that you need to shift about in to keep the power on. I get about 200 - 250 miles to a tank, but mine is the carb version, not fuel injected. The clocks are adequate,displaying revs, speed and the usual idiot lights while a little digital display houses coolant temperature, odometer and trip meter info. There is also a handy little 12 hour digital clock. The chunky tyres give bags of confidence but I find the suspension wallows a bit with preload adjustment on the rear monoshock only. Overall this is a cracking bike and even though i am now opened up the the world of sub 33bhp bikes I am still keeping this smashing little all-rounder. I bought my Varadero to get more practice after failing my Mod 1 test twice on the slow speed sections. It feels so comfortable & stable that I am considering taking my Mod 1 & 2 tests on it despite the fact this will restrict me to 33bhp for two years. I'm 6'+, 17St & 49yo but the Varadero feels like a 600 for size & gives you much more confidence in traffic due to its ride height. I feel I'm 'eye to eye' with the 'Chelsea Tractor' drivers. More expensive than other 125's but well worth it if you have the money. 6 months ... 10,000 miles! i love evry minuite of learning to ride on it. it inspires and helps you grow in confidence . i love it. i past my cbt in late march and got a 2009 model.i only use my bike for plesure and what a plesure it has been.ive clocked up over 1500 miles so far.the ride is smooth and for a 125 the power is fine.do get questioned on size of bike alot as it is a big 125.looking forward to passing test to remove L plates but will be sad to see it go when the time comes to trade in . For my first bike i loved it,and i needed to purchase a bike which was able to take my 19 stone frame i had the bike for just over a year and raked upto 8k comuting into london.I rode it all year round from summer to winter,due to the bike being quite high of the ground and also having a top heavy weight i found that i was been blown across the road a few times.I got it upto 75mph (took a while)and found the gear changing quite annoying after a while.When I passed my advanced test i took the missus out on the back and very nearly killed her (the bike! )so dont look at the pillion seat in hope of it someday being able to carry someone as the bike aint going to like it.Overall if youre a big fella or a big and beatifull babe i would strongly recomend it as a first bike. 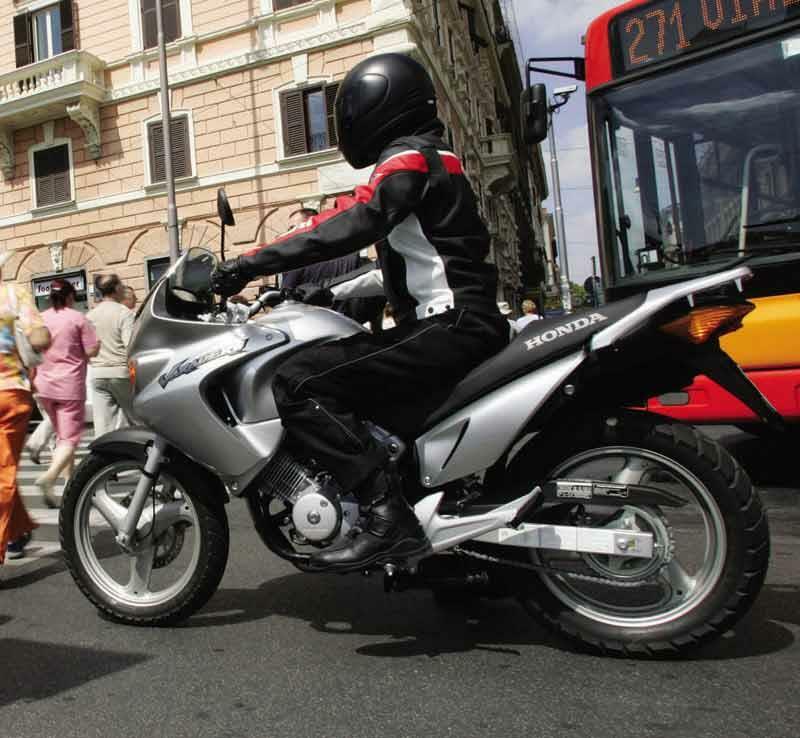 When I bought my 2004 Honda Varadero, I did so with my sensible hat well and truly on. The bike is expensive, there is no getting away from that fact, however, with my biking experience totalling about 20 minutes, the Varadero represented an easy introduction into motorbikes. The bike verges on loveable, it wants, and tries so hard to be a bigger bike, and as close as a 125cc could get The steering is light, has a tiny turning circle, and the bike weighs very little. Add to that the ability to get anything up to 90mpg, means this bike is a great commuter, coupled with an enormous 17l tank, you will get 200 miles per tank easily. If you can get it below 65mpg, then it will be an impressive feat. The 125cc V-Twin engine is a riot. While it lacks any top speed, it will still peak over 70mph, so is a genuine dual carriage-way machine. Acceleration from a standstill can be a little sluggish if you’re slow on the throttle, but the 12,800 rpm peak feels urgent when you want to have fun. Even better, its smooth, which means it won’t try to vibrate you to pieces like a lot of single cylinder engines. As with just about every Honda the gearbox is a bit clunky, but the lack of engine size means it’s pretty good. The odd ‘box of neutrals and false gears is annoying, but are rare. The nicest thing is being able to beat the clutch and gearbox mercilessly and it just thanking you for it. Expect to pay about £1500-2000, which for a 125cc is steep, but you’ll not regret it if you want a truly competent bike to give yourself confidence while you learn the intricacies of biking. If you asked me for the worst thing about the Varadero, it would be you do not get a fuel gauge. On the EFI version (’07 onwards), you get a light to tell you that you are on the 2l reserve. All other versions get a reserve tap, which is ridiculous in my opinion. All in all, this is, in my opinion, THE best 125 you could ask for. It’s as powerful as a 125cc can be, it’s got a lovely engine, can take weight (I’ve been two up and it’ll still do 65-70mph), its 17 fuel tank gives a HUGE range, it’ll try hard when you ask it too, or just trickle along with rush hour traffic, and it handles nicely. Why WOULDN’T you at least consider it? To be honest, when you set out on the bike as a first bike, it feels great, but thats it, it's a first bike. Great engine, good handling and the excellent Honda back-up, but its a First bike, you aint gonna keep it. Great guts, keeps a few of my friends on their toes through the twisty bits, but, all you want is some more grunt/speed out of it. Think its time to move onto a bigger cc bike. In conclusion, great bike, fantastic ride/handling, just a shame the engine is so small. I love this bike. I am new to biking and bought it second had some months ago. It does my 40 mile round trip commute with ease, covering motorways, A, B and C roads. It has started faultlessly over the winter months and I easily get 70-75 mpg. Big and comfy with a great road presence – for a ‘humble’ 125. I find it easy to filter through traffic and quick enough at the lights to get away from most ‘white van men’. I have been cursing the bad weather as I want to get out more, even though I have covered nearly 4000 miles since September! It doesn’t like cross-winds - it is a ‘big’ bike but lacks the power (after all it is only 125). It is heavy and has blown over on a particularly windy day. Centre stand quickly purchased and fitted – a MUCH better job. Honestly can’t fault it and will be sorry to see it go. If I could keep it for the commute and have another bike for bigger runs – I would. I have a 2007 Varadero 125 which I use mainly for commuting. My journey to work racks up about 7000 – 8000 miles a year. Roughly another 2000 miles through the spring and summer for day trips etc. The bike is a good average size. I’m 5’ 10” and can comfortably get my feet down. A well proportioned ‘sit up and beg’ riding position keeps you tall in the seat with a good view of the road ahead. Balance on the bike does feel a little top heavy and therefore can ‘fall’ into turns a little bit, but that is fairly typical of a bike of this height and sitting position. Although it is a heavy bike for the capacity, it can catch wind gusts quite noticeably The seat is quite comfortable for a 100miles before you start wanting to shift around on it for relief. Quite capable of 2 up but it does suffer under the weight. Can handle top box and panniers if that’s your bag. Absolute reliability. I’ve had a 2005 model and now the 2007 model and both have been excellent starters all year round. Service and maintenance costs are quite affordable in comparison to a larger bike. Services tend to be around the £90 - £110 mark. The 600cc I’ve just downsized from was costing more like £200 - £250. Admittedly that is at a Honda main dealer for both, so it could conceivably be cheaper. A small number of parts on the bike do suffer over the winter months like many bikes. Most notably on the Varadero is a linkage attached to the gear shift lever. I’m sure it would of cost little more to make it out of stainless steel. One of the sections on the exhaust also suffer + a few of the fixing nuts. However, keep on top of the cleaning as you really need to with all bikes and you’ll prevent or slow down most of the rusting. Fuel consumption is more like 80mpg. I get 250-260 miles before hitting reserve. Bike will cruise well within its capability at marginally under 70mph. I find the bike happiest at 10,000rpm top gear 68mph, but have taken her up to 80mph for a short period, just over the 12,000rpm red line. Obviously too long there is not going to do her any good if you still want to be riding it 2 or 3 years down the road. Do take into account, this bike is a ‘plodder’, if you want something approaching acceleration on a 125 then consider 2 stroke(high running costs) or perhaps the Yamaha YZF-R (a real looker too). The initial cost of the bike is high by comparison to others, and frankly you have really got want this style of bike to pay that kind of money. However, the quality is good and there probably isn’t a bike of this style and capacity that comes near it. 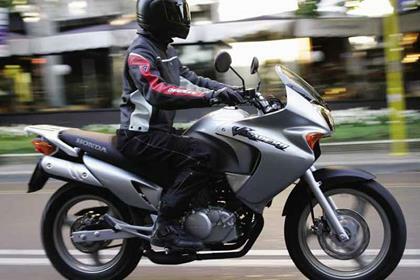 Don’t try to compare the Varadero 125 with larger capacity bikes and you won’t be disappointed. It, and most 125’s don’t come any where near providing the joy and exhilaration available from more cc’s. However, for commuters, and those looking for the comfort of this style of ride it’s almost unbeatable. This was my first bike as a learner and I wanted to get a "proper" looking bike rather than something that looked like a toy. People can't believe it's a 125 as it is huge. Quality of everything is excellent and it's really comfy. Only negative is that it's a bit top heavy and easy to drop for a learner doing slow turns etc... It will cruise along at 65-70, but acceleration over 55 is drawn out. Overall, a learner 125 recommended for anyone over 5'8" who is relatively confident in their abilities as a rider. I initially disliked the specification of the varadero because of the weight, appearance and price. It dawned on me though that it suited my size ( about 6 feet) has good resale value, a big tank and it also made sense to learn on a heavy slow bike because I will probably buy a bigger bike once I pass my test. It's a tallish bike with high, wide handlebars, but it handles nicely and is composed on rough roads. First gear is rather sticky on my bike. Its fine in town up to 50mph but when you see a no limits sign thats when it feels very underpowered and the engine is revving hard at 10,11 thou revs at 60mph. Can't comment on reliability or economy yet. I would have liked a fuel guage - theres not a warning light either. Overall I'm happy that I've made a good choice. This bike is a great, fun way to learn the art of motorcycle riding. Across town the bike is as good as any other. With only a learner legal 15bhp on tap the limits are discovered on dual carriageways where maintaining 70mph is a struggle. Reliability is good, very comfortable and frugal to run.